Thursday night, May 3rd, I made a simploring tour again. I selected “Serendipitous Sands” from scoop.it SL Destinations and read the post of Isabella Coletti (Belladochas Minoptra) about it in her blog “The Second Life Tourist“. 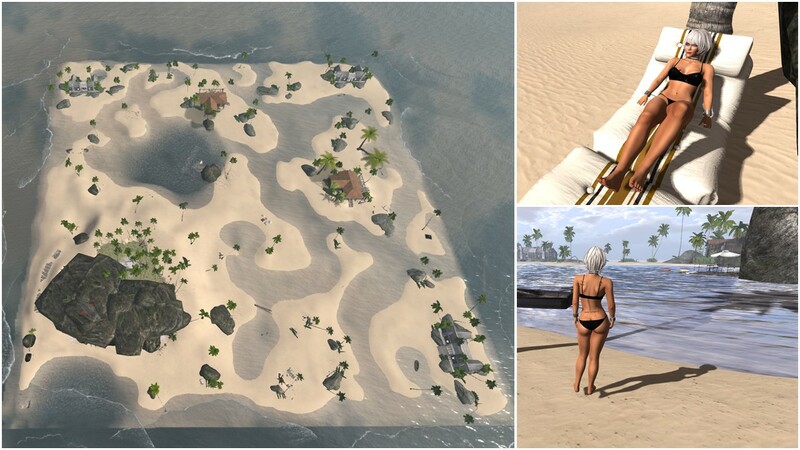 Serendipitous Sands is a beach sim, consisting of several smaller islands. Large parts of Serendipitous Sands are public, on some islands are beach homes, that are rented out. As they are private I kept off. There’s not that much to write about Serendipitous Sands, but there’s a lot to see and to try out, in particular there’re a lot of beach chairs and other beach furniture and places to sit and dream. The sim offers a beautiful background for pictures and of course I took a lot of pictures! This way you’re going to see me on the beach *winks*. Serendipitous Sands is owned by Hoagy (hoagyrosenberg). Thank you Hoagy for keeping a large area public for everybody to use and enjoy.